Huawei P30 Pro vs Huawei Mate 20 Pro: how do the cameras compare? Huawei goes head to head with Huawei. The Huawei P30 Pro has a lot to live up to. Its predecessor, the Huawei P20 Pro, was (and still is) an absolute imaging powerhouse. It was the best camera phone at the time that proved to the world that the humble smartphone could hold its own against a dedicated camera. It was the start of the industry trend towards making the camera front and centre of the phone. And it was in no way a fluke. The Huawei Mate 20 Pro came out months later, with a wildly different camera array and once again proved that Huawei (and its partner Leica) has created the software. Now it’s time for the P30 Pro to shine. The successor to the Huawei P20 Pro has finally been revealed. But how does it do against its own bedfellow, the Mate 20 Pro? Here we give you an idea about the difference in specs, lenses, features and compare images taken on both devices. It has to be noted that the P30 Pro we played with was very much an early sample, without final software, but if the images we took have anything to go by, then Huawei doesn’t have anything to worry about on the quality front. The screen on the Huawei P30 Pro is a 6.47 inches, 1080 x 2340 pixels. The Mate 20 Pro has a 6.39-inch screen with a higher pixel density (1440 x 3120 pixels). While the Mate 20 Pro had a notch, the P30 Pro has been given a dewdrop notch, which is on the top-middle of the screen. The Huawei P30 Pro runs on Android 9.0 and makes use of EMUI 9.1. The Mate 20 Pro also runs on Android 9.0 but currently only has EMUI 9. An update is coming, however, which will give the phone the same software as the P30 Pro. The battery on the P30 Pro is a huge 4200mAh. It’s wireless charging, too, and makes use of Quick Charge. While these specs are impressive, they can also be found on the Mate 20 Pro. Both phones can get to around 70% in 30 minutes. When it comes to power, there is a Kirin 980 chip inside. This is the same chip that was found in the Mate 20 Pro. Ram is up to 8GB and 512GB storage. Here’s where we get to the good part. This is bad news first: there is no monochrome lens this time around. The lens that made the P20 Pro what it was has been ditched in favour of a RYYB colour formation. The two YYs (instead of greens) is said to bring more light to the sensor. That’s enough about the P20 Pro, though, as we’re here to compare the P30 to the Mate 20 Pro. The lens array on the P30 Pro is vertical. This is different from the rather tasty square format favoured by the Mate 20 Pro. On board are four cameras, one of which is a Time of Flight 3D camera. The cameras are: 1x 40 MP, f/1.6, (wide and comes with OIS), 20 MP, f/2.2, 16mm (ultrawide), a periscope 8MP, f/3.4, 80mm (telephoto, with 5x optical zoom, OIS). While the Mate 20 Pro could handle a 3x zoom, the P30 Pro ratchets this up to a 5x optical zoom, that can be pushed to 10x with some clever AI. The Mate 20 Pro’s cameras were: 40 MP, f/1.8 (wide), 20MP, f/2.2, 16mm (ultrawide), 8 MP (3x optical zoom, OIS). There is optical zoom on the P30 Pro 40MP and 8MP cameras - on the Mate 20 Pro, OIS was only available on the 8MP. The selfie camera on the P30 Pro is bigger than that of the Mate 20 Pro - 32MP to 24MP. The Huawei P30 Pro has improved it night capabilities, meaning that you can take a night shot in normal mode and it should come out as good as on night mode. There’s hardly any waiting around, either as the processing time has been improved. ISO has been boosted, too - up to a frankly crazy 409600. The Mate 20 Pro goes up to 102400. 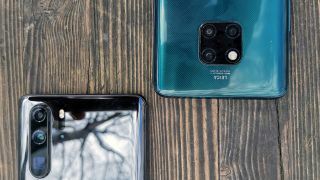 While we will have to get the P30 Pro in for a thorough testing, it is a camera phone that, on paper at least, matches and somewhat surpases the Mate 20 Pro. The night mode has been improved, some UI changes (having AI as a toggle on the main screen, separating macro mode into its own feature), and that incredible 5x optical zoom means that this is one handset that’s going to be hard to beat. The following are sample photographs taken from an early software build on the P30 Pro. While they aren’t representative of what you will see on final release, we thought it was worth showcasing them as the early signs are very good.